Tomorrow, Monday, March 4, we will be OPEN with NO bus transportation! The West End Day Nursery of New Bedford, Inc. was founded in 1941 by Elnora M. Williams; incorporated in 1944. 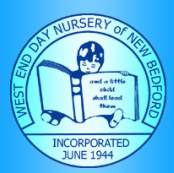 The West End Day Nursery of New Bedford, Inc. is a non-profit, tax-exempt, charitable institution organized to provide proper care and supervision to children including family service, child development, education, health, recreation and nutritional programs.